Leah Brilman is a professor of Agronomy and Plant Genetics and for the last 40 years she has worked with plant breeding mainly in amenity grasses. Leah Brilman did an interesting presentation that focused on the benefits of planned overseeding compared to overseeding when the problems occur. Here, the problems due to the growth conditions and aggressiveness of P. annua were highlighted very illustrative. She advised on the optimal seeding seasons for different grass-species. She also touched upon the climate change we experience in Denmark and other parts of the world, as well as how to do grass management in that context. After the presentation the attending greenkeepers had the opportunity to talk with the grass professor about their own courses. On her trip through Denmark, Leah Brilman visited the DLF headquarter in Roskilde, where she exchanged experiences and ideas with the DLF international product managers. 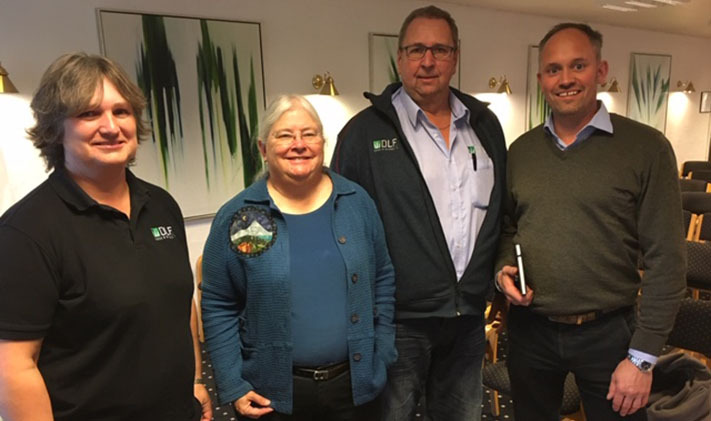 She also visited our sales department in Odense to catch up with her plant breeder colleagues at the DLF Plant Breeding & Research center in Store Heddinge.